DISCONTINUED. 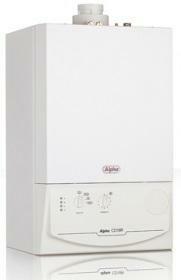 The Alpha CD28S is a gas fuelled condensing boiler which offers versatility through its considerate design and compact size. Alpha's CD28S offers a huge boiling capacity ideal for even the largest homes. Standing at a robust 40 kg the unit exudes strength and stability which translates from the perspective of the user into longevity of use. The Alpha CD28S is replete with the functionality with which the range has become associated and clearly the boiler has been designed with the user in mind at every stage. The twin pillars of simple use and reliability are engaged equally rendering this boiler a definite point of consideration either for upgrading or simply replacing an older model.